Cover Size: 9" x 9 9/16"
Form size: 8 11/16" x 9 3/16"
Check size: 8 1/8" x 9 3/16"
This set of desktop checks comes complete with 300 business checks, 60 free 3-on-a-page deposit slips, a transaction register and an attractive cover. If you already have a desktop cover, you can reorder only the Desktop Checks, Deposit & Register. No more being chained to your desk! You'll discover how easy it is to take your work out of the office when you own this compact and portable desktop check kit. Get your own Desktop Checks with deposits, register and cover right now! 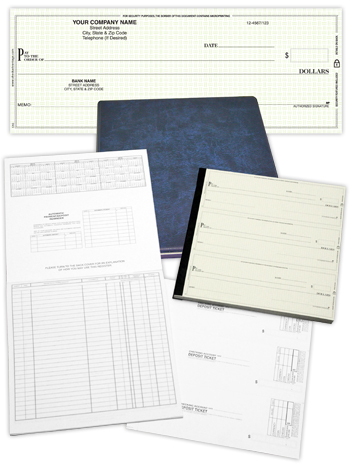 Overall Size: Desktop checks are business sized. The finished product with no cover measures 8 11/16" across and 9 3/16" high. The checks themselves are 8 1/8" x 9 3/16" and with the cover it measures 9" x 9 9/16". Need a color logo? Please call.